ROSENBERG, TX -- Rosenberg police are looking for a suspect in an aggravated robbery, and they're hoping the public can help. But the sketch they've released will require some imagination on the part of viewers. At about 6:30pm Saturday, a man was taking his daughter out of his vehicle in the parking lot at 3101 Place Apartments, Vista Drive, when he was approached by a white male wearing a black ski mask. The victim described the suspect as wearing a gray and blue button-up, short-sleeve baseball jersey, faded blue jeans, and black and red tennis shoes. The suspect demanded money and property, while displayed a long barreled, black revolver. The suspect fled once the victim surrendered his property. Investigators are looking into all leads, including a similar robbery at Lamar Park Apartments, 1800 FM 1640, Richmond on the same day. The victims in that case reported the suspect as a white male who was wearing a jersey with the number "20" and shorts. The suspect was armed with a pistol and demanded money and property. The Criminal Investigations Division is asking for the public's help in identifying this suspect. Unfortunately, the description available from the victim leaves little identifying information to go on. 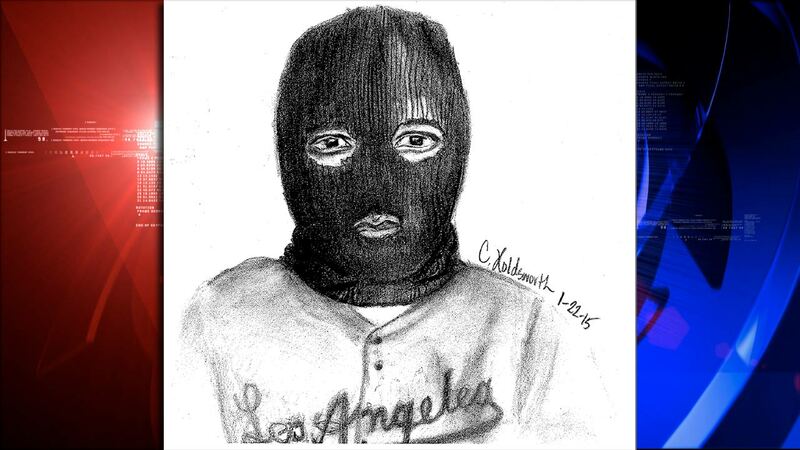 If you are able to recognize the individual in the sketch or have any information, you're asked to contact Det. R. Leonhardt at 832-595-3700, or contact Crime Stoppers at @ 281-342-TIPS (8477). You can remain anonymous. Reporter Kevin Quinn is following this story today and will have the latest on Eyewitness News beginning at 4pm.